Give your office a distinguished, professional look.. Our refurbished boardroom tables meet top quality standards at remarkably more affordable prices then one would pay for new boardroom furniture, making us the leading supplier of quality second hand office furniture in Johannesburg. 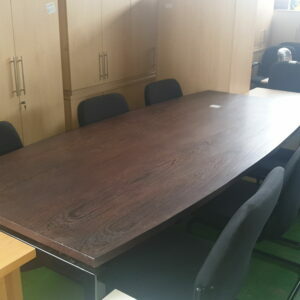 Visit the Has Been Office Furniture showroom in Randburg to view our range of used boardroom tables and chairs which form just part of our wide range of quality second hand office furniture for sale and delivery in Johannesburg. Another, if unsung, advantage of buying used office furniture is the fact that second hand office furniture has an “established” look, providing the impression of permanence to any business, even a young one. Why not match your boardroom table with your reception furniture. This gives an impression of continuity and style to your clients and other guests. Reupholstering the boardroom chairs in your corporate colours is also an option. This provides a professional feeling of the company and will still be a less expensive option next to new office furniture. Presentations can be catered for by drilling neat, inexpensive cable management holes in the boardroom table. This allows for conference calling facilities as well as network connections to be installed. A projector can either be simply placed on the boardroom table or a bracket can be used. Has Been Office Furniture could supply matching boardroom chairs, sideboards, side servers and whiteboards. 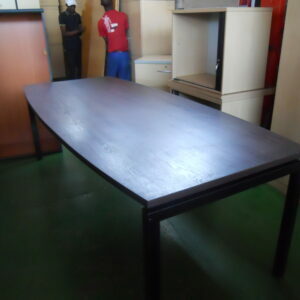 We also carry a large range of other pre-owned office furniture such as filing cabinets, office desks and chairs, couches, stationery and roller cupboards, pedenzas, credenzas, screens, bins and more. You can also find special offers online, or order custom made new boardroom or conference tables and office furniture from our manufacturing division. 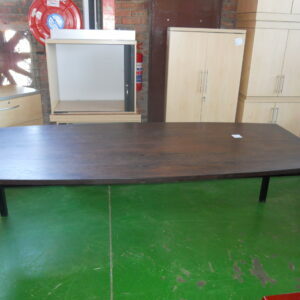 We supply, deliver and install all of these items rapidly within the greater Gauteng region. Contact us today for all your office and boardroom furniture requirements and get the best selection and prices.